This newly renovated and well-appointed beachfront studio apartment does a lot with its cozy space. The living area features a full, memory foam bed, flat screen TV, full size couch, with an amazing view of the white sand beach. Modern kitchen features a stove, fridge/freezer, convection microwave, granite counter tops and breakfast bar. The apartment has an open air screened-in porch, also overlooking the beach where you can enjoy a beverage and watch the waves lap against the white sand of Love Beach. Separate and spacious bathroom with rain shower-head, and separate detachable adjustable hand-held. Bathroom also includes drawers and storage area. Shampoo and Body Wash dispenser in shower. The apartment's main window and patio look straight out at the famous white powder sand of Love Beach, lined by lush tropical greenery. 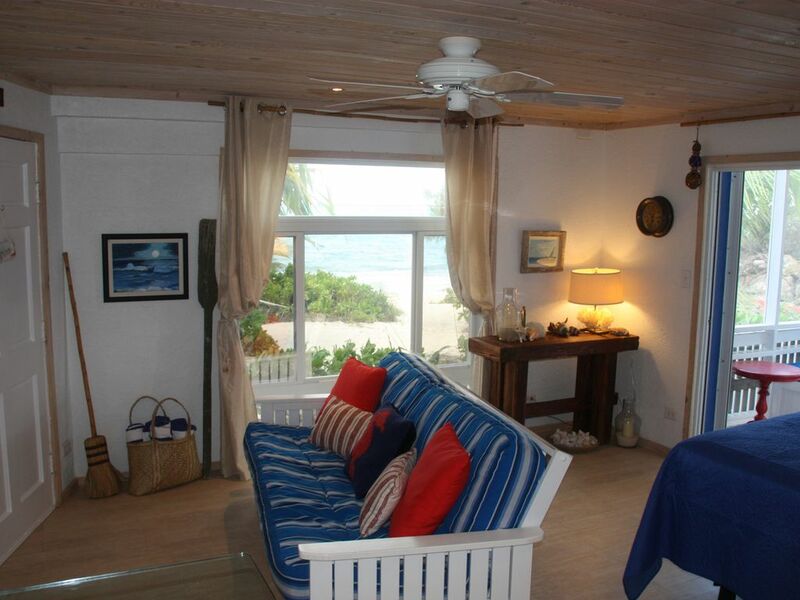 This cozy apartment is literally right on the famous white powder sand of Love Beach. At high tide, you are less than 40ft from the warm turquoise water! Bottled water is provided for your use. Condiments, including olive oil, coffee, and tea. Full kitchen with microwave, glass stove-top, granite countertops, breakfast bar, and stainless steel refrigerator / freezer. Great blender! Breakfast bar in kitchen. Outdoor porch can also be used as a separate eating area, weather permitting. Cushioned seats on indoor patio also. Available to rent from Nirvana Beach Bar, a few steps down the beach. Snorkel masks and snorkels provided. Portable Beach Chairs and a cooler for beach beverages. Loved every thing about this place! Chuck and Mary Ann are amazing! The beach is literally at your front door, secluded and quiet. Located next to many delicious restaurants with in walking distance, as well as local authentic cuisine. Convenient to local transportation. Neighbors are all friendly and helpful. Would definitely stay here again! Fell in love with Sea Star on Love Beach! Mary Ann & Chuck are wonderful hosts! They are very nice & have everything you need for a remarkable vaca. The condo has a good size small refrigerator (our pizza box from Wildfire in Old Fort Bay Town Ctr fit plus all our other cold food & beverages), coffee pot, electric hot water kettle, cook top & all of your basic kitchen necessities plus some. The internet and cable tv is very good if you need an electronic fix. A tall counter is perfect for eating meals inside or on the screen porch with a nice breeze or outside on the adirondack chairs. There is A/C, but we preferred to have the windows open to enjoy the cooling tropical salt breeze. There is a desk if you must do a bit of work & plenty of surfaces throughout to spread out your belongings with cabinets & drawers to tuck things away. The full size bed is very comfortable. It only lacks the space to have nightstands to place reading glasses & a bottle of water - so we just tucked them near the bed on the floor. I didn’t lounge on the nautical futon sofa, but used it to put on my footwear near the door. Everything in the condo is well thought thru & serves a purpose. The nautical theme is delightful for interior eye candy. The wood-look tile floor is easy to sweep up beach sand & a huge plus if you have allergies. The bathroom is spacious enough to use as a dressing area. The shower with the rock is nice with 2 different shower heads. I only used the standard shower head, but my husband was delighted with the rain head. The pedestal sink has wide edges to place toiletries. The Sea Star has an amazing view of turquoise jewel-colored water that is set brilliantly against lush green foliage & a blue sky. Wake up and fall asleep to the waves rolling in on the golden sand and the lovely view. We had a stunning rainbow one of the days. There is snorkel gear available along with beach chairs, beach towels & outside water to rinse off your feet or body after playing in the sparkling ocean. A wonderful grocery, Solomon’s Fresh Market, is a short drive away stocked with everyday conventional items and a plentiful selection of organics & healthful items. There is a gas station, liquor store & restaurants next to the grocery. You have access to any level of entertainment you enjoy: quiet book reading on the beach to going into town for tours, shopping, etc. Non-stop action or total relaxation or anything in between is the Love Beach lifestyle. Love Beach was like a second honeymoon! My wife and I just recently returned from our stay at the Sea Star condo at Love Beach where we were celebrating my 40th. Communication with Mary Ann and Chuck prior to our trip was very helpful made us feel comfortable prior to our arrival. Our flight was delayed which actually worked out to our advantage because Mary Ann and Chuck were able to attend a prior engagement during the day and then pick us up at the airport when we arrived. Within the first 15 minutes of meeting Chuck and Mary Ann it felt like we had known them for years (very comfortable). Mary Ann was able to drive us to the grocery store on our first full day so we could stock up on breakfast and lunch items while exploring the local food options for dinner. Sea Star Condo is exactly as advertised. Our stay consisted of many walks & jogs up and down the beach, swimming, snorkeling and just lounging on the beach reading books. The condo itself is absolutely perfect for the two of us and I could even see us there with our two kids sleeping on the futon. Within less than a 5 minute walk is Nirvana which is a great place to hang out and have a beer/cocktail. The woman working are very friendly but their hours of operation are sporadic so don't plan to eat dinner there unless you eat early. Our favorite place to eat dinner was about a 20 minute walk down the beach and then across the street called Studio Cafe. We ate there twice because the food is amazing and its a great atmosphere at night sitting outside on the deck. We also ate lunch at a small shack type place called Dino's on the side of the road near Studio Cafe. They have the best conch salad!! We also ate out twice at Compass Point Resort right at the end of Love Beach which is about a 15 minute walk. The first night we ate there was a little tainted because our waiter was no good. We decided to try it again a few nights later and sat at a high top table at the bar area and had a much better experience. We had also set up massages at Compass Point which was an added bonus to our vacation. There really is no need to rent a car unless you really want to do a lot of exploring to different areas of the island. We took the Jitney bus downtown twice which was very easy and comes regularly but be prepared for a 20-25 minute ride to downtown that can get a little crowded and the driving on the island is a little crazy. We highly recommend staying at the Sea Star Condo on Love Beach and miss Mary Ann and Chuck. We were sad to leave Love Beach! The beach is beautiful and you could not ask for more wonderful hosts. Awesome place to get away from the crowds!! Love Beach is a great beach that is away from all of the crowds from cruises or resorts. The VRBO is right on the beach!! Fall asleep and wake up to the waves!! The owners are great too!!! Very helpful and friendly! Beachfront condo literally right on the beautiful Love Beach. Just returned from a week at Sea Star. We had such a relaxing week! The beach is unbelievable, and being literally steps from your condo is so convenient! The condo is fully stocked with anything you would need. Pictures are very accurate to what they offer. You can’t go wrong here! Mary Ann & Chuck really went out of their way for us. From meeting us at the airport, taking us to the store & checking in with us periodically if there was anything we needed. Such a nice couple! Really enjoyed meeting & visiting with them! The people in Bahamas are so very helpful & friendly. From everyone at Nirvanas ~ just a very short walk from the condo! The Jitney Bus Drivers, when we ventured into Nassau, & the locals in town. Felt very safe & they all seemed to go out of their way to help us. We enjoyed relaxing & snorkeling right off the beach. Walking to Nirvanas & Compass Point. Very short & enjoyable beach walks. Ventured out to the Straw Market, Watkins Distillery, Queens Staircase & enjoyed the local food & drinks. If you are looking for a relaxing, stress free beachfront condo, this is it! Sometimes felt as thought we had this whole beautiful Love Beach all to ourselves. Thank you Mary Kay & J! We are so happy you enjoyed your stay on Love Beach in Sea Star condo! What great adventures! We love the story of your jitney rides and the people you met along the way! Thank you for your wonderful review of our little piece of paradise. You are always welcome! The apartment is located on the western end of New Providence Island on Love Beach. This really is beachfront - your front yard is the powder white sand of Love Beach fringed with lush tropical greenery and palm trees. If you are looking for a relaxing and romantic beach break, where you can kick (and keep) your shoes off, this location is for you. While some beaches on the island can feel crowded and commercial, on Love Beach you'll find just a handful of happy beachcombers. The amenities at the condominium complex include an outdoor fireplace and a hammock for snoozing under the palm trees. A pleasant 15 minute stroll down Love Beach takes you to Compass Point - a picturesque oceanfront resort with a restaurant and bar. Several other restaurants lie within 2 minutes of Compass Point. A modern and well-stocked supermarket lies less then 5 minutes away by car or taxi. While a car is not necessary, it is recommended if you are staying more than a few days and want to explore. It is also very helpful for getting to and from the food store. Cancel 14 days or more before booking, 50% of rental fee, together with cleaning fee and damage deposit returned. Cancel within 14 days of booking, only cleaning fee and damage deposit returned.